Perpetua was a nursing mother who rejected her father’s pleadings to deny her Christian faith and make the requisite sacrifice to the Roman emperor. As the story goes, depicted above, she had to help guide the sword of her trembling executioner to her throat. Her father immediately came to her in prison. He was a pagan, and he saw an easy way for Perpetua to save herself. He entreated her simply to deny she was a Christian. In the next days, Perpetua was moved to a better part of the prison and allowed to breastfeed her child. With her hearing approaching, her father visited again, this time, pleading more passionately…. The day of the hearing arrived; Perpetua and her friends were marched before the governor, Hilarianus. Perpetua’s friends were questioned first, and each in turn admitted to being a Christian, and each in turn refused to make a sacrifice (an act of emperor worship). Then the governor turned to question Perpetua. 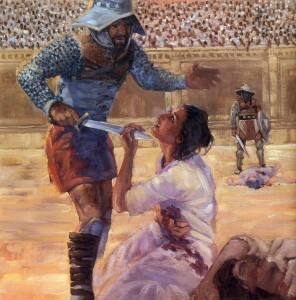 …When [Perpetua and her friends] entered the stadium, wild beasts and gladiators roamed the arena floor, and in the stands, crowds roared to see blood. They didn’t have to wait long. Immediately a wild heifer charged the group. Perpetua was tossed into the air and onto her back. She sat up, adjusted her ripped tunic, and walked over to help Felicitas. Then a leopard was let loose, and it wasn’t long before the tunics of the Christians were stained with blood. This was too deliberate for the impatient crowd, which began calling for death for the Christians. So Perpetua, Felicitas, and friends were lined up, and one by one, were slain by the sword. The whole account can be found here. As All Saints Day approaches tomorrow, I find myself moved and inspired by this committed follower of Jesus. Perpetua, though she was mercilessly separated from her husband, family, and precious little baby, is at peace. Hi Abram – you might be interested in my reflections on Perpetua and Felicity, whose story we studied recently in my early church history class. I note some specifically feminist and specifically theological themes I see in their account. This is fabulous. Thanks so much for sharing it with me! Much to be learned from these accounts. I had not heard the story of the breast milk drying up–a gentle mercy, indeed.